Energy Theory is the one area that creates the most disputes among different Feng-shui schools. Apart from those prior to the Great Grand Master YANG, there exists “Feng-shui based on Trine Theory” or “San-he Feng-shui” 三合風水, “Feng-shui based on Flying Stars” or “Xuan-kong Fei-xing” 玄空飛星, “Feng-shui based on the Circular and Rectangular Diagram of the 64 Hexagrams” or “Xuan-kong Da-gua” 玄空大卦, etc. All of which were supposedly derived from YANG’s master thesis, namely “Classic of Heavenly Jade” or “Tian Yu Jing” 《天玉經》, but why are they so different? Which one of them represents the true meaning of YANG? And most of all, are they really connected to YANG’s Terrain Theory as described in the “Classic of Shaking the Dragon” 《撼龍經》? JIANG Da-hong 蔣大鴻, a Ming’s government official candidate, spent his time in researching YANG’s Feng-shui theory after the Qing 清 Dynasty took over the Ming 明 Dynasty in 1644CE. In his book titled “Feng-shui Corrections” or “Di-li bian-zheng” 《地理辨正》, he pointed out the mistakes which people commonly made in applying YANG’s Feng-shui theory, but obviously not explicitly enough. “The Collections of the Energy Theory from the Great Grand Master YANG Yun-song” covers three of YANG’s Feng-shui thesis, and one from his apprentice ZENG Wen-chan 曾文辿. They are namely “Quick Reference Guide in a Green Bag” or “Qing-nang Ao-yu” 《青囊奧語》, “Classic of Heavenly Jade” 《天玉經》, “Dou-tian Bao-zhao Jing” 《都天寶照經》, and “The explanation of Qing-nang” or “Qing-nang Xu” 《青囊序》 respectively. “Classic of Heavenly Jade” delivers the secret of Xuan-kong Feng-shui, the deployment of Yin and Yang in Feng-shui. Whereas, “Dou-tian Bao-zhao Jing” brings out the technique of Feng-shui reading if the mountain is not yet to be seen, especially in scenario of “Empty Sitting and Full Facing” setting. Legend has it that YANG was a senior official of TANG Xi-cong 唐僖宗 (874CE to 888CE), but how could he been promoted from Entry Level (at most Level 8) to Level 3 (Level 1 is the top level) just within 6 years and yet the mystery is that it is not registered in any of the official history record. Chapter 1 reveals the history of YANG Yun-song. Citation of the “Quick Reference Guide in a Green Bay” 《青囊奧語》. Revealing the secret of Xuan-kong Feng-shui 玄空風水 which is unknown to the general public before Qing 清 Dynasty, which includes the deployment of Yin and Yang in Feng-shui, the application and implication of the Energies of mountains and rivers, the Dipper Settings, the method of embracing the good energy and suppressing the bad energy, the water placement method, etc. People may believe this is not YANG’s genuine work, but the Feng-shui theory therewith is in line with that stipulated in the “Classic of Heavenly Jade”. It reveals the special technique of Feng-shui reading where the mountain is not to be seen, especially denouncing the wrong perception of the inauspiciousness of the “Empty Sitting”. Citation of “The Explanation of the Green Bay” 《青囊序》. This book is written for people who want to know the explicit meaning of YANG’s Energy Theory and how does it relate to the Terrain Theory. 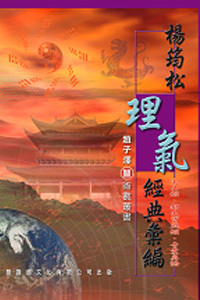 It is also recommended as the reference book of Xuan-kong Feng-shui.